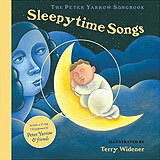 Book reviews: "The Peter Yarrow Songbook: Favorite Folk Songs" and "The Peter Yarrow Songbook: Sleepytime Songs"
These reviews first appeared in the November 16, 2008 issue of the North County Times. 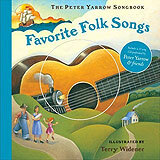 PPeter Yarrow, one-third of '60s folk music icons Peter, Paul & Mary, has written a couple of children's books with a unique twist: They're lovingly illustrated books for the younger set to read to themselves, and they're also sing-along books with not only the lyrics, but chord changes and audio CDs. Yarrow has impeccable taste in selecting folk songs, and he scored when he enlisted artist Terry Widener. Widener is a veteran children's book illustrator, with several dozen titles to his name. Bright colors and bold shapes give the books a friendly, warm ambience. But it's the songs that make "Favorite Folk Songs" and "Sleepytime Songs" so appealing. Yarrow's half-century love affair with folk music has given him a broad, deep knowledge of the folk canon, and he has assembled two wonderful collections of traditional songs. The "Sleepytime" collection features obvious choices like "All Through the Night" and "Hush, Little Baby," and also lesser-known gems like "The Water is Wide" and "Who's Gonna Shoe Your Pretty Little Foot." "Favorite Folk Songs" also contains an even dozen songs, and the selection is as nice a mixture of the expected and the pleasant surprises. "I've Been Working on the Railroad" is a nice balance to Irish folk nugget "Cockles and Mussels," "The Erie Canal" a traditional counterweight to the Caribbean lilt of "Sloop John B." Yarrow also devotes a couple pages at the back of each book to talking about the songs  giving a bit of history about them, indirectly explaining whey they were selected. Since most of the songs are traditional with hundreds of variations, Yarrow clearly had great leeway in selecting the lyrics  the ones he's used are by and large geared toward readers in the second- to third-grade level, but will still be enjoyable by readers who are slightly older. The text does tend to be a bit on the small side for younger readers, but the books should still hold the interest of a fairly broad cross-section of elementary school-age children. Yarrow is joined by his daughter, Bethany, on the CDs, which have a bare-bones charm about them: two acoustic guitars, two voices. But Yarrow's deep, resonant voice is as rich as ever as heads into his 70s, and Bethany's soprano is dappled by the same golden overtones as her father's voice. And their reading of Brahms' "Lullaby" is just lovely. The straight-forward arrangements serve the purpose of the books well, as each book is divided in half  the first half is a children's book, with the lyrics presented over Widener's full-page illustrations; the second half features each song's lyrics again, but this time accompanied by guitar chords for playing along. As performed on the CDs, no one need be intimidated about playing along to the Yarrows. Gorgeously illustrated, gently performed on CD, these two books are treasures for families with young children first coming into exploring and performing music. Hopefully they're just the first two of many to come from the Yarrows and Widener.